lol Annie. You're argument is weak. In terms of negotiating we clearly have the upper hand. 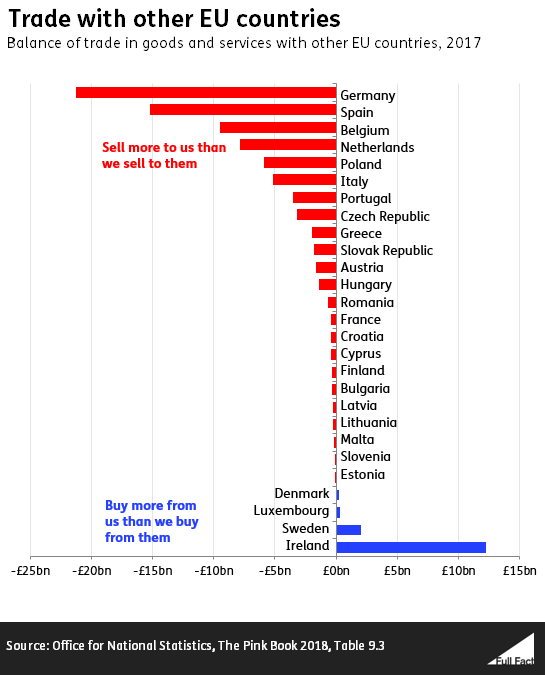 Whilst we need imports we won't be tied to having to use Germany, Spain, Belgium etc once we leave. The notion you table of us making imports easy for them whist having exports being difficult if farcical. Why on Earth would we ever accept or agree such a situation?! If we say bye to German exports where will they replace that business? They stand to lose BILLIONS ! We don't need to buy BMWs and AUDIs and the like. Sure they're nice but we don't need to buy them. If the EU isn't going to play ball with BrExit then neither do we need to play ball. Walking away with NO DEAL in the immediate term is THE only way forward here. Nobody plans to remain in a No Deal situation obviously. But NO DEAL comes first, then the EU pretty much HAS to play ball because once we are out then all the above trade with the member states is at risk and as can be clearly seen, they will lose far more than us. The sell more to us than we do to them. Who will pick up the BILLIONS of deficit? Other EU member states? Italy is in crisis, many other member states aren't doing to well either. While ever we continue allowing our EU stooge politicians to concede to the EU and not properly fight for a deal, we remain in a weak position when in fact we should be in a very strong position. then everyone comes back to the negotiating table with tails between their legs and we can establish proper deals. OGF I don't get the point you are making. We have always been reliant on imports. That isn't going to change after Brexit. In fact we have said we will make it easier to import by slashing tariffs & waiving checks. So I don't see how the EU will have anything to lose. But if we make imports easy but the export side is hurt then that means problems for us. We need free trade agreements to function as an economy. Making this an "us and them" debate is completely ridiculous and warped. We are part of a global economy. Something some people fail to understand. Because the EU is a political construct trying to control member countries in what they say and do. It could be that those countries will choose to ignore EU diktats and trade directly. If that happens, the `raison d'etre` of the EU becomes obsolete (as it should). Suggests many EU member states have much more to lose than we do from BrExit.! Well, I am very glad for you. You must have stashed away a lot of production capacity somewhere in the inlands of wales and scotland. Or will you continue buying ? Remember then you cannot deal with germany, netherlands, spain, belgium (we as EU members are not allowed to). You have to buy from the EU in brussels. So you need a trade deal. In May's deal there is 2 years provided (with a possible extension of another year). Crashing out with no deal all trade stops. Haven't you still not realised that? We will be the biggest single market for the EU after We leave. Would you rather we all drive Toyota's & Nissans and bought all our food from the commonwealth instead ? And be taken to the international courts? You must be an ignoramus! I advise buying local to save JBR from bankruptcy. Diesel fumes need not bother you. Commonwealth? Most of those have trade deals with the EU and not with you. I advise buying local to save JBR from bankruptcy. Trade will happen no matter what and particularly imports from the EU (because we desperately need to have a proximate trading region with a guaranteed supply and within regulated markets). But they certainly don't need our exports as much as we think. Countries can be very protectionist if they have a legal framework to make that happen, so businesses won't have a say unless they want to break the law. They won't need much of an excuse to say Nein danke. We won't be replacing German imports because we need them. Along with other EU imports. I don't know where you get these ideas from. Trade with the EU countries won't cease. There will just be more red tape all round. Of course nobody needs a BMW, an Audi or a Mercedes. You think that because people don't need them the demand will suddenly dry up? Dream on. NB I understand BMW produce here. No doubt they will go back on that pesky diesel ban to revive car production in the UK...that along with reopening the coal mines once our EDF contract for nuclear goes belly up.